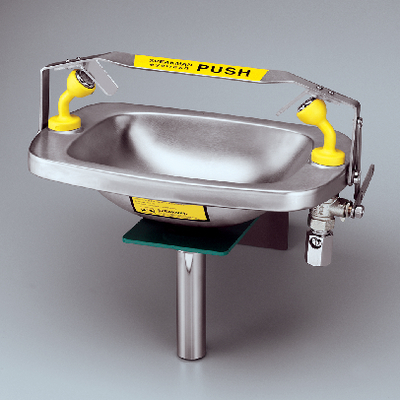 Wall mounted rectangular eyewash bowl. These eyewashes are available in wall-mount, and pedestal-mount styles. They offer twin aerated sprays for gentle, yet thorough rinsing of the eyes and face. Delivery information: The units are supplied with a rectangular stainless steel bowl and panic bar activating system.